The signature brand of the BrassCraft Manufacturing Company, BrassCraft provided the first flexible plumbing supply lines to the industry. 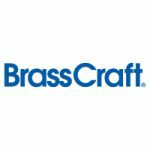 BrassCraft products include Speedway® water supplies, and Speedi Plumb PLUS™ hot and cold water connectors. Flexible gas and water heater connectors are also offered, as are gas ball valves and fittings, brass fittings and water-saving showers. BrassCraft is supported by a robust Canadian team that includes product development, engineering, manufacturing, sales and marketing.